How many days can one continue to indulge in foodie heaven!!? 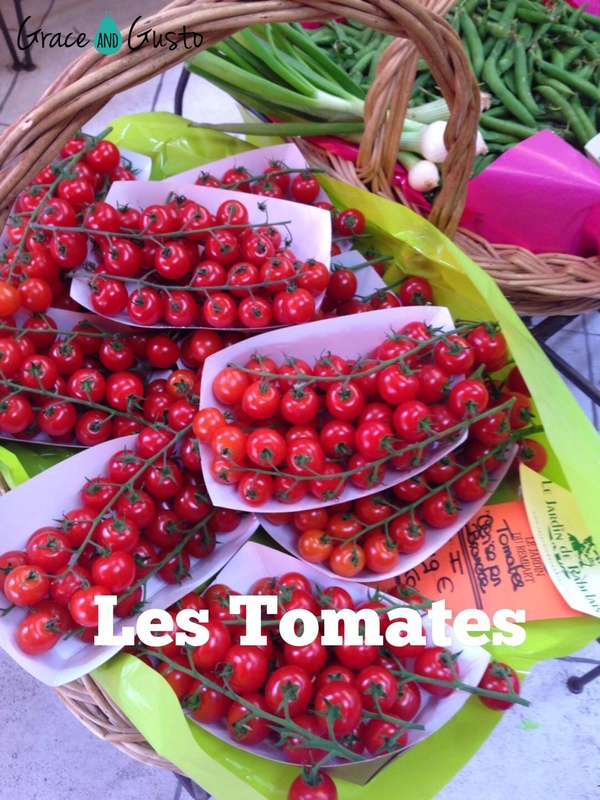 The Languedoc region of South France is known for its incredible array of fresh produce. On every day of the week you can find fresh food markets within a thirty minute drive. I’ve explored Limoux, Mirepoix, Carcassonne, Quillan and several other smaller villages over the last few days and I’ve learnt some valuable lessons already: buy only what you’ll eat that day and the next; cheese goes with every meal and even though they say the markets open at 6.30am, don’t bother showing up until 8.30am. I had an unexpected but pleasant opportunity to cook for 4 last night. I kept it very simple as I was working in an unfamiliar kitchen, but the produce made me look good. It needed so little fussing with because it’s so fresh and in many cases it’s organic (and has been forever!). I chose a very fat piece of cod (cabillaud) (only AUD24 for 1.2kgs) and served it simply with a lemon, butter and herb sauce, roasted cherry tomatoes, blanched asparagus (the biggest and sweetest I’ve ever seen!) and baby pommes de terres (potatoes). The French always serve a salad afterwards with cheese – most often just a bowl of plain salad leaves with vinaigrette. And of course there is always a baguette or two on the table. I post this in haste as I am out the door for my next gastronomic experience – seafood no doubt as we are now in Sanary-sur-Mer. This is for sure one of France’s best kept secrets. Only an hour from St Tropez, two from Nice and yet this cute little fishing village tucked away from the tourist hype offers superb fresh seafood in restaurants nestled right at the port – at very reasonable prices. I’ll report back on my verdict soon! Categories: Food, France | Tags: fish, France, graceandgusto, graceandgustofood, seafood, travel | Permalink. This is a risky post … I’ve gone beyond jetlag and have turned to blogging therapy to rid my brain of imagination overload! After 36 hours of travel, we arrived in Toulouse. But the beautiful and very welcome French cliches started well before that – in fact they started in Hong Kong as we boarded our flight to London. The air host – he was a Frenchman (what do we call male hostess’ these days? ), asked where we had traveled from and where we were headed. When he found out we were connecting through to his home town, he burst into a passionate babble about where we should go to eat. I couldn’t help but smile knowingly – he had no idea I’m a mad foodie and yet in typical French style, the first thought on his mind was restaurant recommendations – this is reason #26 on my list of why I love France! Just as a side note – I’m pretty sure my blonde travelling companion has “gorgeous Australian gal” tattooed on her forehead. She commented very innocently about how friendly the French are … I assured her that her presence helps with that. So, armed with a handwritten list of six restaurants, we headed into town with two goals: stay awake until at least 6pm (it’s now 8.30pm! ); and find a place to create a memory for lunch. We nailed both. We ate at Au Bon Graillou above the Marches de Victor Hugo (Victor Hugo Markets). The decor was very traditional – certainly not modern and typically not fussy at all – they’re more concerned about the food. For a total of 14 euros each, we oohed and aaahhed our way through three courses and a glass of local red. We both had a goats cheese salad for entree – it was confidently simple. The lettuce was uber fresh – crispy, crunchy rocket and buttery baby lettuce leaves dressed in a mouth-watering vinaigrette. Honestly I would have been happy with just a bowl of salad on its own. But to show off, the chef had crowned this dish with slices of fromage de chèvre doux on toast topped with honey and ever so lightly grilled. I’ve never experienced a texture like that before and we were both left speechless with how good it tasted. Le Plat Principal was fresh cabillaud which I was sure must be some exotic French fish I’d never tasted before. But when I looked up the translation I was shocked to discover it was simply cod! It was cooked to perfection in a buttery, herb sauce and was light enough to allow room for dessert … More cheese for me of course. My companion ordered the very last piece of white chocolate, raspberry and pistachio tart. And I’m so glad she did because this literally left us gobsmacked. I ran out of adjectives in my French vocab to explain to the very enthusiastic waitress how impressed we were with this heavenly dessert. We left after paying way too much of a tip (I learned this later at the cheese shop) and went on to explore the town. We bought some berries, tomatoes, baguette, fromage and yogurt. The stores were like something out of a movie. The grocers asked us when we intended on eating everything so they could provide us with exactly the right instructions on how to store the food – they just REALLY care about presentation and ensuring we enjoy their produce in the very best possible way. Quite charming. Day 1 has left us very impressed with Toulouse. Tomorrow we stop in at Carcassonne before heading further east to Bellegarde-du-Razes. 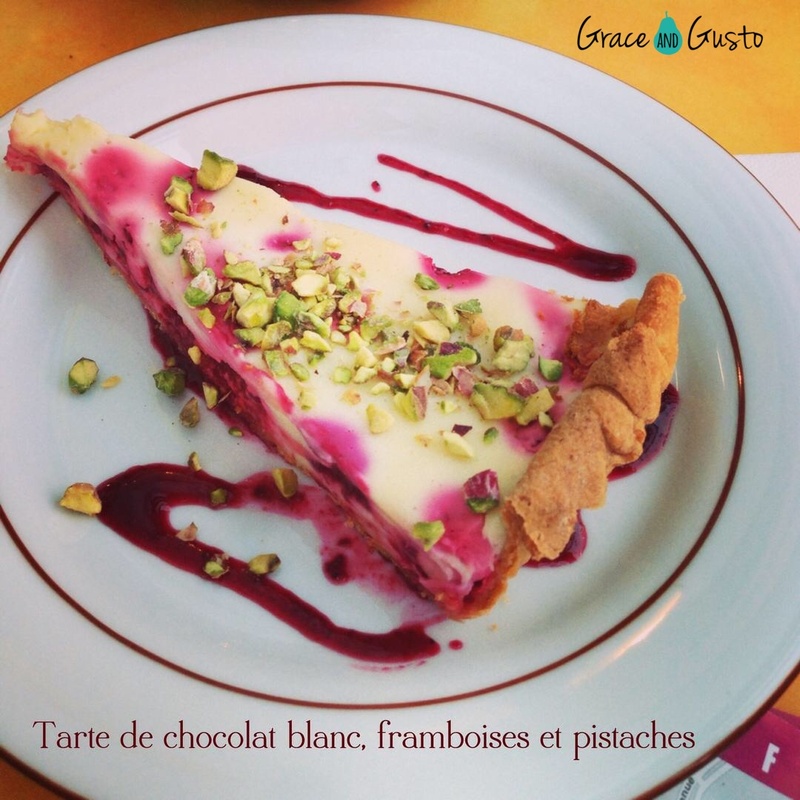 Categories: Food | Tags: dessert, fish, France, graceandgusto, graceandgustofood, markets, Toulouse | Permalink. Nothing like a last minute post before I jump on a plane to France (yes I am curling my toes in excitement!). I’m sure none of you are like me, but I often feel like a little something at night once the kids are asleep and the house is quiet. I am what you call an intuitive eater. That doesn’t mean I binge or eat whatever I want to, but it does mean I don’t deprive myself. I do tend to prefer sweet foods over savoury, and so I’ve become quite good at identifying healthy choices to give my body what it feels like. So tonight I just grabbed a few of my very favourite things (raw cacao, coconut and macadamia nuts) and threw them all together. I didn’t really mind what they looked like, but I was pleasantly surprised at two things: how quick and easy it was to make; and how well they held together and therefore looked like an indulgent dessert (ok, that’s three things). These little babies would be perfect to serve guests with coffee after dinner. 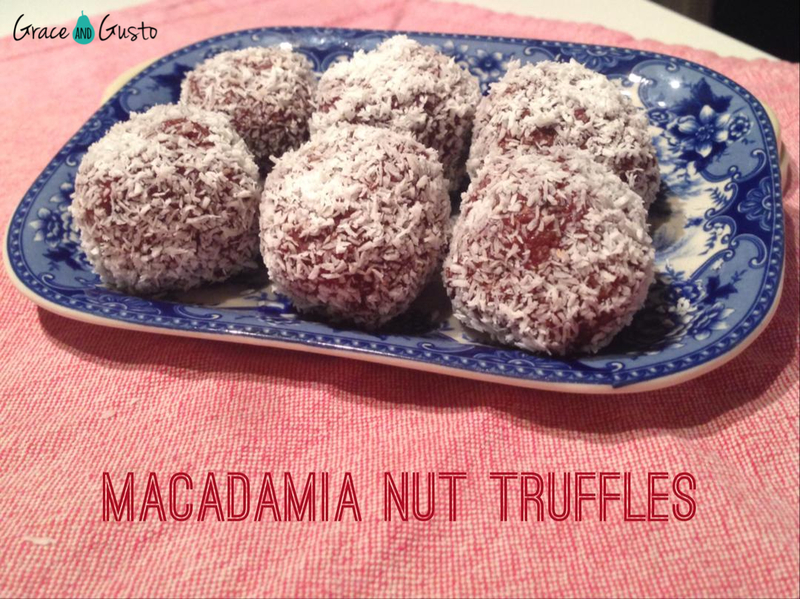 The macadamia nuts have loads of nourishing natural oil which meant I only needed one date to pull it all together! Combine the nuts, coconut and cacao in the TM bowl on speed 7 for 5 sec. It should have a moist but crumbly texture. Add the date for 2-3 secs until combined. The mixture should easily stick together. Roll into 6 balls and coat in extra desiccated coconut. Store in freezer for an hour for best results or eat straight away if you can’t wait!! Hope you enjoy these – there are so many versions of these you could try with different nuts and seeds – would love to hear any other suggestions you have. My next post will be from La Belle France … a bientot, mes amis! 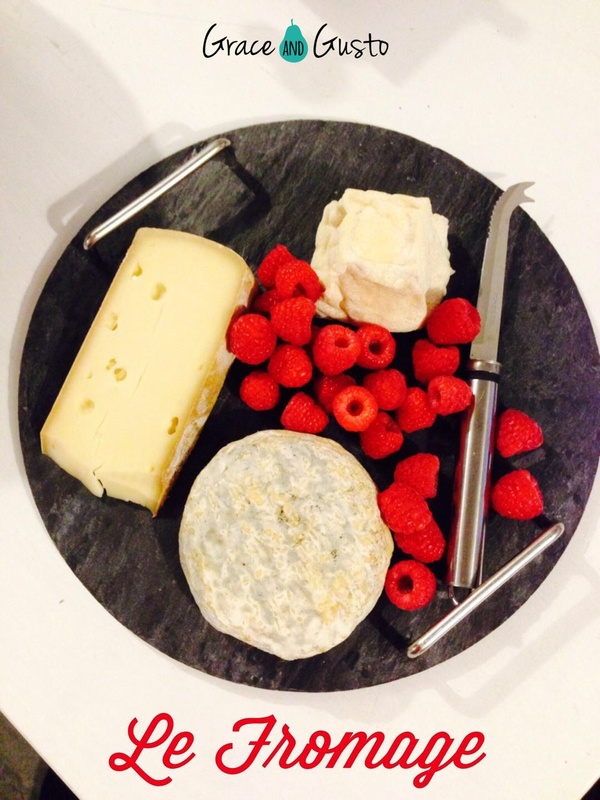 Categories: Food | Tags: coconut, France, graceandgusto, graceandgustofood, macadamia nuts, raw cacao, raw dessert | Permalink. 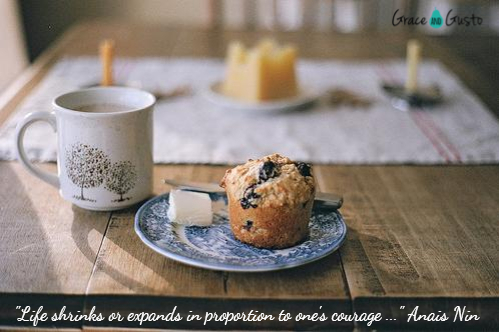 Words from the heart today … no recipe. I have had a couple of conversations with different people over the last week that has made me decide to write this post. I want to share a little about my journey with food, cooking and entertaining because I’ve come to a bit of a revelation this past year that perhaps others of you may be struggling with. I have always loved food … as a younger person I mainly enjoyed eating it. In my early twenties I loved eating out and in my thirties I am reveling in learning how to cook everything I can imagine. But I must confess for quite a while, I didn’t believe this passion of mine was “useful” or “productive” in my life. I thought of it as something I should do only if it didn’t interfere with other, more important tasks. It was a nice skill to have, but not something that really meant anything. I have a background in small business and for ten years I wrestled with the corporate “struggle” of holding my own in a cut throat industry as a young woman. I simply believed that I had to put my head down and bum up, stay tough and cocky and make sure no one saw my weaknesses. This was what was expected of me, right? It didn’t matter that I didn’t love what I was doing, as long as others thought I did. My heart has changed so much from that insecure, egotistical business woman and I’ve come to realise that life is all about relationships with people and making a difference wherever I can. What I didn’t realise is that my skill with food could be a major people connector and an impactful way to make a sincere difference for people and organisations. 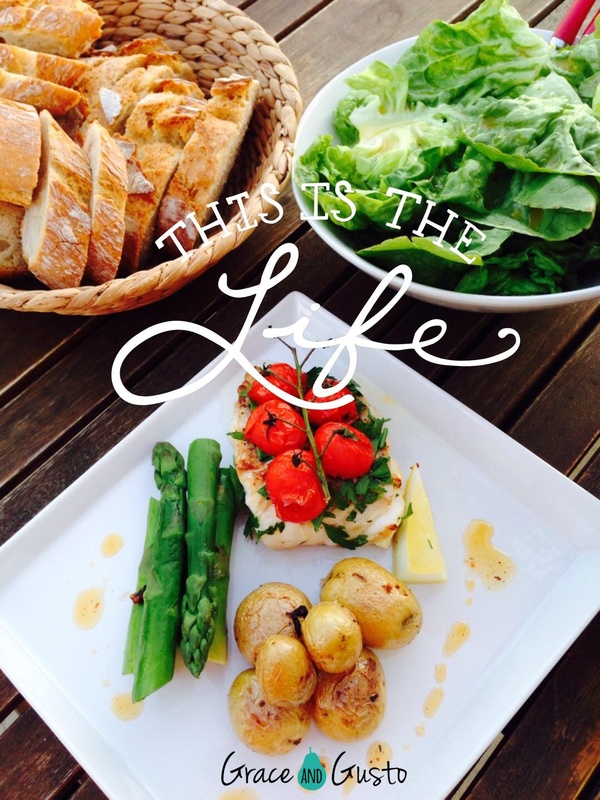 I had a light bulb moment the day I realized that my passion for food was actually a GIFT. And so I’ve put my foot to the floor and used my gifting wherever I could (it’s possible I have overdone it … I’ve called this my year of professional volunteering). What have I discovered? That if you’re doing what you’re truly passionate about – not for financial gain – you have an enormous capacity to do lots of it and to gain tremendous energy from blessing others with your gift. I have found opportunities to do this through school, church, friends, family and other charity work. And I’ve discovered a very exciting way to share this journey through my blog. So can I encourage you? Whatever it is that you truly love to do, grab a bottle of red, an encouraging spouse or friend, and start brainstorming the possibilities. Take the time to plan out your priorities in life and you will discover how your passions fit into that puzzle. It may not be the time for you right now to make any changes, but having the plan in place is the most critical element. Our year abroad in France next year has been ten years in the planning. It took work to figure out how it was possible, but my passion has fallen into place within that dream and I hope for the same experience for you and yours. 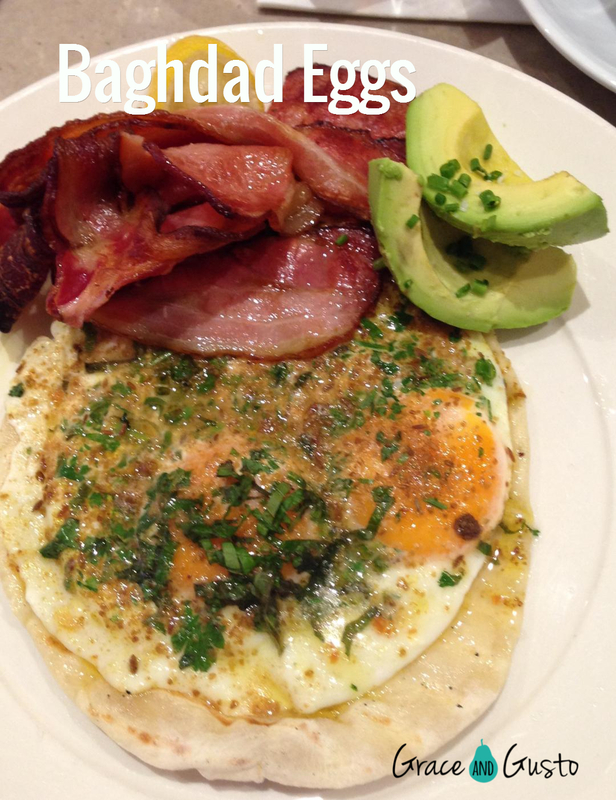 Baghdad Eggs – ode to Queen Stephanie Alexander! My son’s school is lucky enough to have a Stephanie Alexander Kitchen Garden, which I believe will do wonders for exposing children to real food, how to grow it and how to enjoy cooking with and eating the produce. I think Queen Stephanie is a pretty special soul and so I feel very comfortable giving her all the glory in this post. One of my Christmas presents last year was the food bible – Stephanie Alexander’s “The Cook’s Companion”. What a fabulous book and why didn’t I invest in it sooner?! She has also written a book dedicated to the food in South-West France. This is the region we’re planning to live in next year so I just had to have this book … what a treat it will be to read up on a certain providore in a particular village whilst driving through it! I have a feeling the posts on this blog will come thick and fast whilst I’m there :). We spent some time in Melbourne over the Christmas-New Year holidays so I tracked down the Richmond Hill Cafe & Larder, where Stephanie was a partner for eight years from 1997. I loved the ambiance of the French-inspired bistro. They seem to have perfected the art of 5 star service in a relaxed environment. 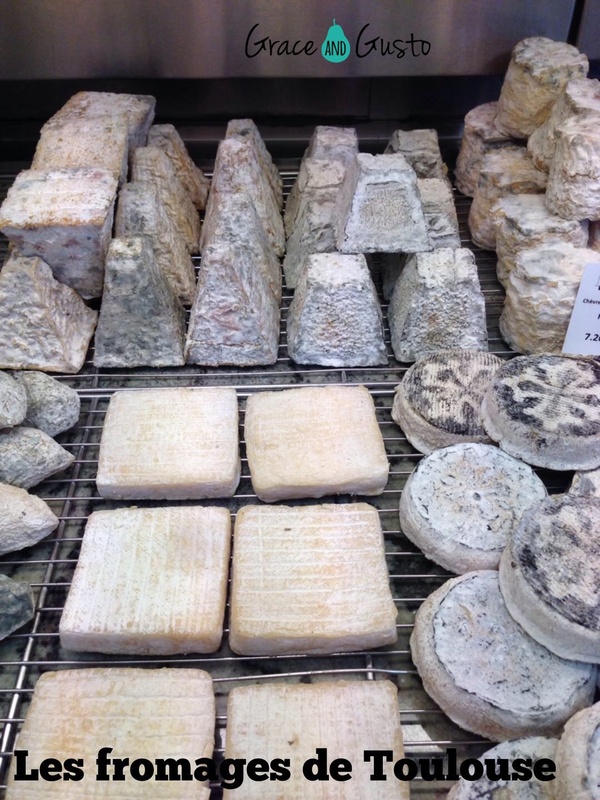 I strategically sat looking at the in-house Cheese Room that – luckily for my husband – wasn’t yet open that morning. He saved himself some time and money I can assure you! So RHCL’s signature dish is Baghdad Eggs. Its a pretty simple dish really (the good ones always are!) but the combination of cumin, garlic and mint give this traditional bacon and eggs dish a really fresh twist. I couldn’t wait to try this dish at home. For my version of Baghdad Eggs I skipped the pita bread and kept it fast and simple so you can spoil yourself mid-week. The result was a delicious twist on my beloved eggs for breakfast. Give it a try and surprise the family … would love to hear what you think. Heat EVOO in a non stick pan and saute garlic for 30 sec before adding the cumin and lemon juice. Crack eggs into pan and cook to your liking. You may wish to add a little more cumin on top of the eggs. You can serve the eggs on your favourite toast or pita bread, top with yogurt and mint leaves. Simple! Categories: Food | Tags: eggs, France, graceandgusto, graceandgustofood, melbourne, stephaniealexander, Uncategorized | Permalink. Pancakes and ice cream are our family’s traditional birthday breakfast for the kids. They ask for it every year. And this year, my son’s special request was for the pancakes to be chocolate. So, despite the cold snap, I was up early to fulfill his birthday wish. 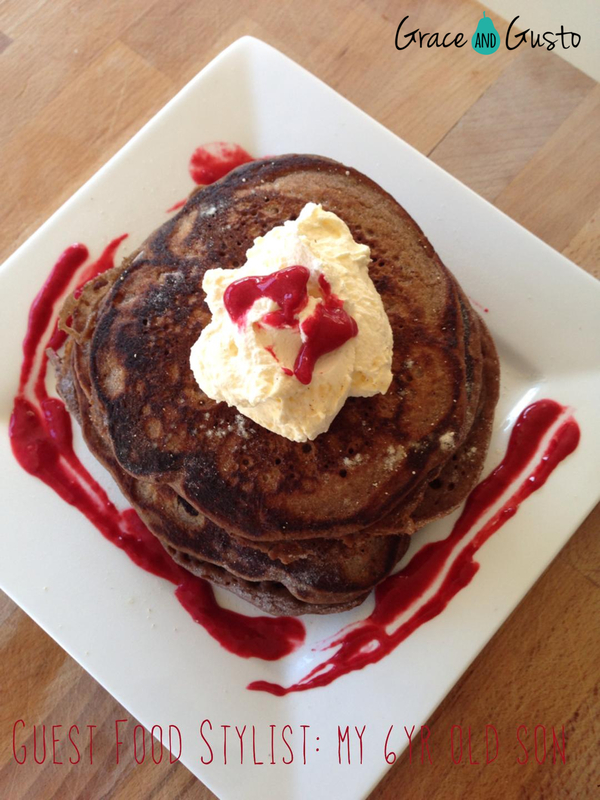 My ricotta pancake mix is one of those reliable recipes that turns out perfect every time. When I don’t use ricotta, there’s no telling what the result will be – sometimes they’re too thin, other times the batter is too thick. 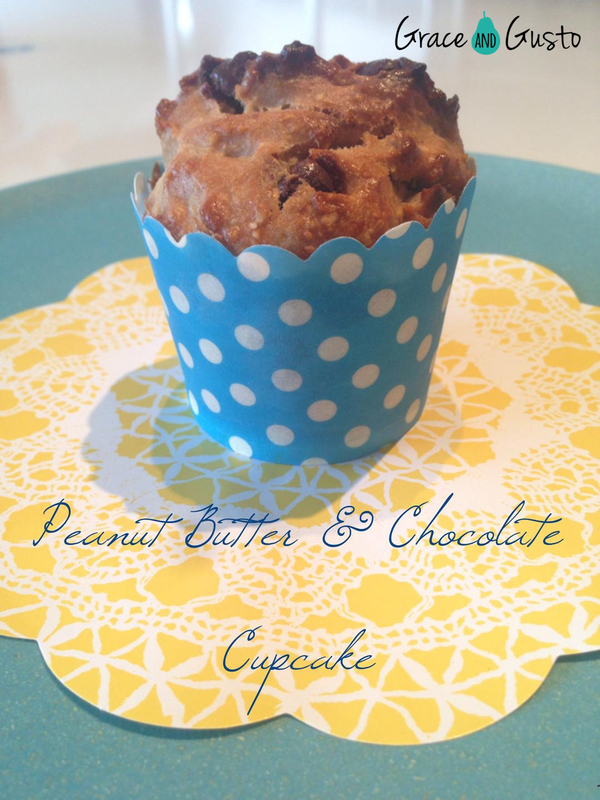 But I can assure you that this recipe works every time and it’s so quick and easy. 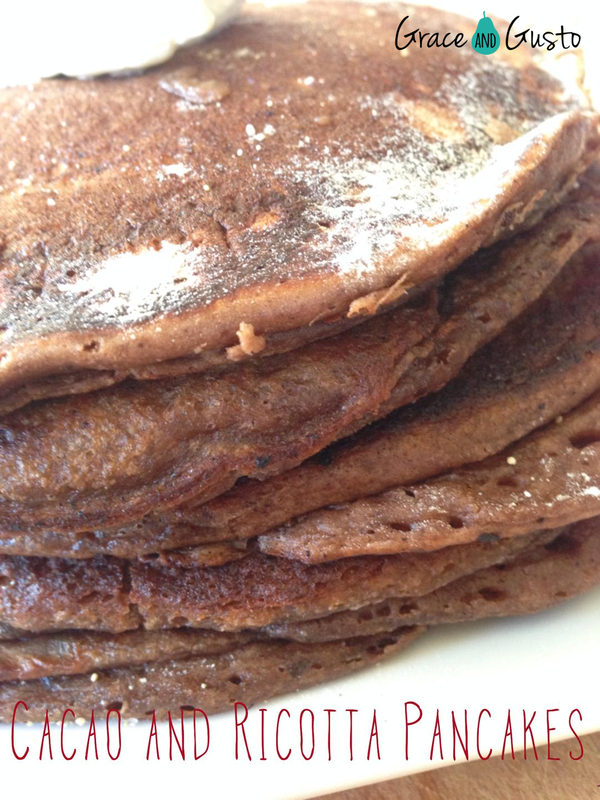 Adding raw cacao powder (get rid of the nasty commercial cocoa) boosts the nutritional value of the pancakes and the ricotta provides some much needed protein (will also fill them up quicker). I whizzed up a raspberry “ice cream” that was more like a sorbet to please my fussy client, using my Thermie. You could also just serve with berries – fresh or frozen. If you’re using a Thermomix, melt the butter at 60 degrees, speed 1 for 1 minute. Add all the remaining ingredients and combine on speed 4 for 20 seconds. Scrape down the bowl and repeat. If using electric beaters, melt butter on low heat before adding to remaining ingredients and mixing on a medium speed until smooth. Cook the pancakes in a non-stick pan on medium heat. While they’re cooking, you can make the raspberry sorbet in your Thermomix by adding 1 cup frozen raspberries and 1-2 tbsp maple syrup (adjust to your taste) to the bowl and mix to a thick, icy paste on speed 4 for 30 seconds. You may need to add a tablespoon or two of cold water to achieve desired consistency. Serve the pancakes warm with cream and sorbet or fresh berries. Indulgent!